Sun Peaks is Canada’s second largest mountain resort with 4,270 acres and 360-degrees of ski terrain spread over three mountains. The biggest of those is Tod Mountain, which was also the original name of the ski area in 1961. Nippon Cable of Japan purchased the resort in 1992 and doubled its size, adding eight new lifts in nine years and expanding onto Sundance and Morrisey mountains. Nippon Cable should be a familiar name; the company licenses and sells Doppelmayr technology throughout Japan. Thus Sun Peaks is North America’s largest 100% Doppelmayr mountain. Today Sun Peaks operates 9 lifts, all but one of which were built since 1993. 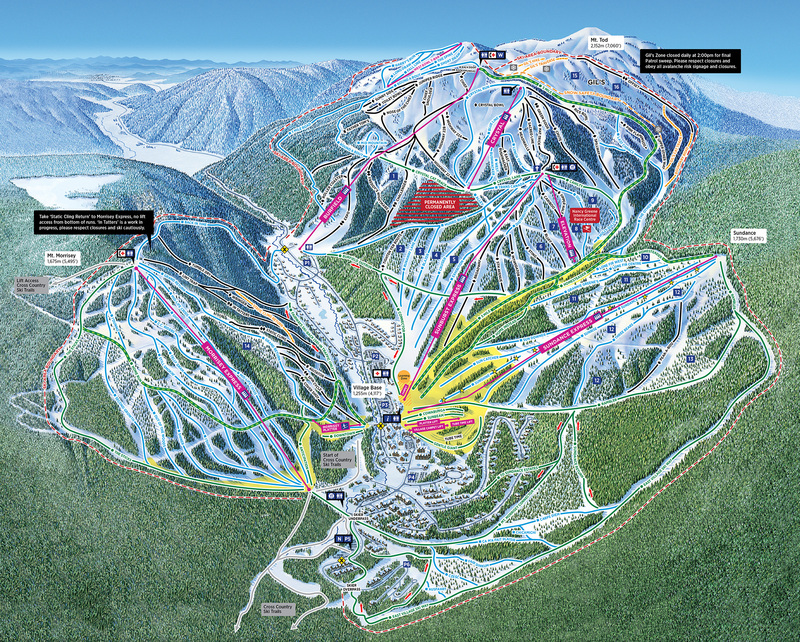 Ecosign Mountain Resort Planners updated the master plan for Sun Peaks Resort in 2013 that aims to expand lift service into new areas and make significant changes to the current lift system. Many of the proposed changes center around the Top of the World, the ski area’s 6,824-foot summit. The two lifts that currently end here will be shortened or removed and three new ones added. The Burfield quad (the world’s longest fixed-grip lift) will be shortened to just above its current mid-station. Primary access to Top of the World will become the Crystal Express, a six-pack replacement of the Crystal triple chair in a new and extended alignment. A 30-passenger aerial tram is proposed from the top of the Sunburst Express to Top of the World for sightseeing. A new high speed quad called Sunnyside Express would come from the west and top out near the two other summit lifts. The West Bowl T-Bar would be replaced with a new, longer version while two of Sun Peaks’ three detachable quads – Sunburst and Sundance – would be replaced with six packs. The missing link between the village and Mt. Morrisey would finally be added with a new West Morrisey quad chair. Under Ecosign’s plan, Top of the World would no longer be the top of the ski area and this is where it gets interesting. The long-proposed Gil’s lift would be a fixed-grip triple re-used from Crystal serving advanced, northeast-facing terrain near the summit of Tod Mountain. A high-alpine platter lift would serve the same summit from the opposite side. This would be Sun Peak’s second platter to run in the shape of a triangle. Triangle surface lifts are used when the terrain between a desired top and bottom terminal is unsuitable for a skiable track in a straight line. Thus the uphill side is split into two skier-friendly sections with a turn while the light side takes the direct path from top to bottom. Perhaps most unique would be Lift 13, a fixed-grip quad with three stations. Instead of running as an up-and-over lift with loading at opposite ends, this lift would have loading in opposing directions at a low point in the middle. One unload/bullwheel would be on Tod Mountain’s summit while the other would be shared with the top of Gil’s and the triangle T-Bar. This would be a destination not only for stellar high-alpine skiing but also riding some very unique lifts. Three-dimensional rendering showing new Orient Express, Crystal Express and Todd Mountain lifts. The third component of Sun Peaks’ master plan is further expansion to the east serving new beginner terrain and real estate development. The Orient Express would be a fourth six-pack (or shorter quad initially) with a pod of low-intermediate trails. The McGillivray lift would be another funky quad chair with loading in opposite directions from a low-point mid-station along McGillivray Creek. One side would provide access Mt. Morrisey while another, longer section would go to a huge new beginner area on Orient Ridge with another quad chair and up to four platters. Rendering of the new Orient Express and McGillivray lifts with additional real estate development. At full build-out, Sun Peaks would operate 27 ski lifts serving a vertical rise of 3,130 feet. For that to happen, Nippon Cable would need to sell the real estate and spend the kind of capital they did in the late 1990s and early 2000s. During that time, British Columbia’s ski industry built almost 60 new lifts worth $200 million before the great recession hit the province hard. Since 2008, the same BC ski industry has built just eight new lifts, an average of just one per year. Hopefully that changes soon with Sun Peaks playing a big role.